That is a fine looking bike reflection. They did not last long but a good reflection. Thanks for hosting and have a wonderful weekend. These bikes have been removed from any cities because of vandalism and theft. A very sad similarity around the world. Can imagine some people are not too careful with someone else's bike. Too bad - it seems a great idea! I suppose they make the bikes look unattractive to deter theft. 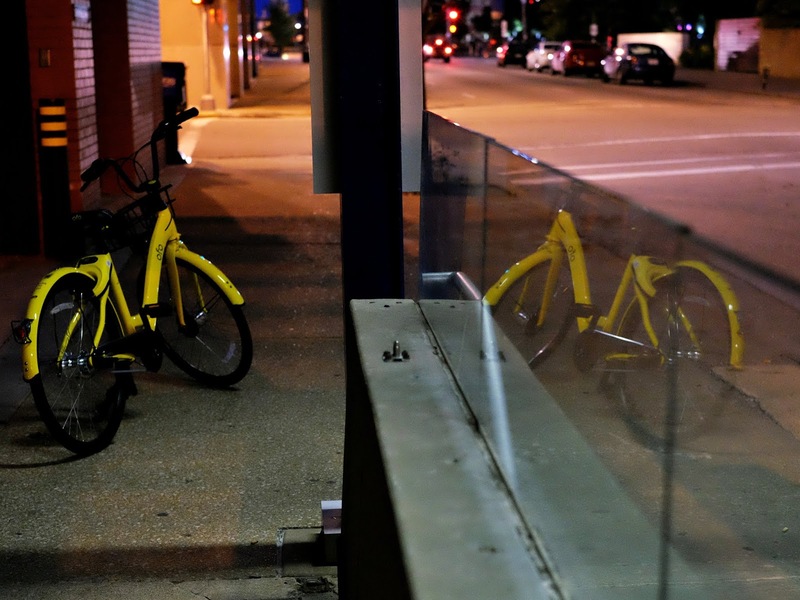 Of course, someone might want a yellow bike. Electric scooters are now the craze in Fort Lauderdale, whizzing between pedestrians on the beachfront boardwalk, but they will be banned during "Spring Break" months of March and April. The company will try to survive through the shutdown. Too bad they could make a go of it. Yellow is sporty for cars, there's quite a few yellow Corvettes around. Color probably wasn't the reason for going out of business. Yellow sure made a fine reflection for you to find. You have a special eye for it. A good one again.